My first question is: will the dual hoses divide the pressure being sucked out of the pool. (my 1600 gal sand pump was more than adequate to vacuum, use skimmer with the 1 suction outlet). Wondering what gal sand pump will provide close to that same amount of suction through 1 of the 2 hoses going out into the 1 hose. I purchased a new 2800 gal pump, (knowing the pump that comes with intex won't filter well enough for my needs), its on its way, will that be enough? Is it simple math, or more complicated? I have no clue. My second question is: I have had 2 salt systems, 1st worked great until cracked due to age. replaced with a 2nd I thought was the same performance wise, just looked a little different, yet it never did it's job. Only recently did I notice reviewing the spec in the books of the 2, there are 3 differences I hadn't noticed prior. Amperage o.5a vs 1.1a, wattage 65w vs 125w, maximum chlorine output/hour 5 grams vs 12 grams. The 2nd comparison being the one happy with til cracked. Probably a stupid question, but is my assuming that the higher numbers in 2nd comparison is the reason for the better results I got, as I purchased another one like my 1st, on its way. (Looking back at the descriptions of both previous purchased, they both say work for the same size pool. Yet specs weren't provided. I just trusted them). I have only filled my pool up to the suction outlets, as I wish to find a remedy for fitting adapters to use my skimmer, vacuum, etc. Searched intex for parts, not much help as no sizes are mentioned, only part #s. Hoping to find someone who may have already remedied the size adaption. Another reason for staying with intex, is that I have stocked up on extra hoses, parts, etc. just in case. Now they won't fit as is. Btw, my neighbor is experiencing the same exact situation (replacing an intex with a dual suction outlet pool). Hoping others' may have advise after switching also. If you haven;t seen it yet, Useful links for fellow Intex Pool Owners might hold your answer. And maybe this will get some exposure and replies. I had this happen to me when I upgraded to our current 18' intex. I have a 14" sand filter and had to block off one of the inlets to vacuum. The bigger hoses are 1.5" and I believe the smaller ones are 1.25". I was planning on upgrading to a skimmer this yr so instead of trying to modify their changes, I added Hayward skimmer about 1.5' past the last inlet. I left that closest inlet on a valve but not hooked to anything (with the intention of using it for a sprinkler with my extra little pump) and I PVC plumbed the skimmer with a T so I could have dual suction. I thought if I need to I could turn off the valve on the inlet that was T'd in but it's vacuumed at the skimmer great with them both running. 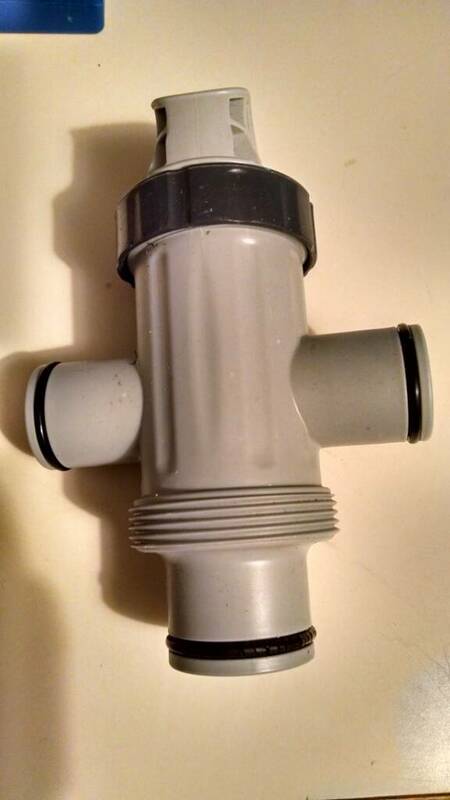 Thank you so much for the great info, & pic but my new pool doesn't have the valve option to connect outside of pool to the suction outlet like yours. (I have pics, yet, every time I attempt to upload them here, nothing happens). My new pool has 2 'rubber tube' connectors going through the suction holes. 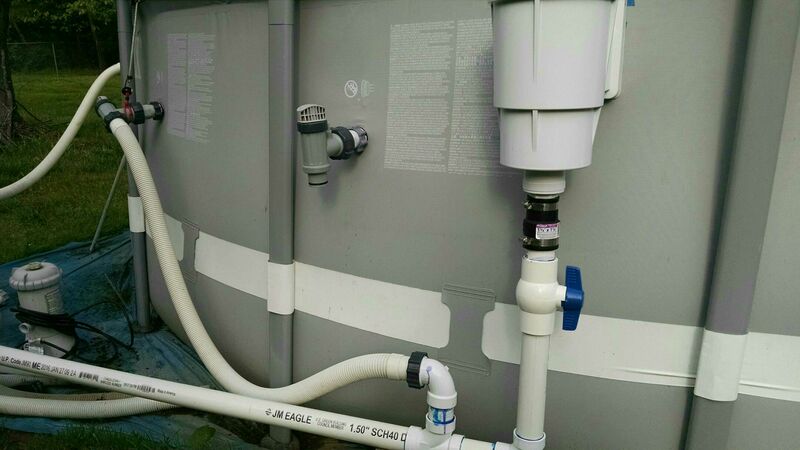 The tubes come installed with the liner/pool wall. On the exterior you simply attach a metal clamp over the small clear hoses to hold it in place over the 'rubber tubes', then the hoses meet together into a T shape 'dangling' valve that the pump hose attaches to. I saw a link here, how to cut larger hole to adapt to pump hose fitting, which interested me as a solution. However, there is no way to block the water from the 2nd suction outlet. The only way to block water is via the T shape 'dangling valve' that the 2 hoses from suction holes join with prior to attaching to 1 hose going to pump. So wish I could post pics. . My apologies for layperson terminology. The valves I have attached came with the larger pump. They came with adaptors to increase the rubber 1.25" to the 1.5" valve..I have some extra parts from upgrades so let me break the parts down and see if I can find part numbers for you. this is that funky 3 way valve.. I was so disappointed to find this after upgrading to the bigger pump. This is the little part that increases the 1.25" to the 1.5"
This is how they go together. My current set up just closed off the second valve and is pulling from the skimmer. Maybe you could eliminate the second inlet but I'm not sure if that would pull enough water considering it's the smaller inlet. Someone else might know better. Oh, i forgot..I just put the little black plug over the inside of the second, not used, inlet and then the valve on the outside so I could use it later. Thanks again, I do have those extra parts in my tub full of extras, lol. I never would have thought that the black tube would fit into adapter. Will try it after rain stops. sadly, I didn't get black plugs like my neighbor did with her coleman. will check with intex to get 1. that would be great if it works. If so, 1 small tube hole problem solved. Did you cut a larger hole for skimmer? greatly appreciate your time. here are the plugs. They fit over the inlet from inside the pool. I cut the skimmer in this year. Ordered from In the Swim (online) and between forums and pictures here and YouTube I was able to add that by myself. It wasn't hard and was thinking of doing a step by step pictorial... That was hard to find online. You're the Best! Since its may 09 & my pool is merely half full. Need to get it filled to warm up here in MO for grandchildren. I'm going to buy plugs, copy your valve adapters install, closing off 1. Now I will feel better about not having the hanging & splitting of the small clear hoses. I did find that the suction fittings are flow rated to 2160 gph, so assuming that is for each 1 individually as it reads, all should be well. Having your pump split with skimmer, do you feel that the 1 hose can handle the pressure of 1600 gph? I see some sort of bungie cord ? on yours. I will do that also. Step by step pictorial would be very helpful, I'm sure. I was surprised that I couldn't find any. Glad to assist with any pics from starting point. I'll be sure to take them for you, anyone. I did the split hoses for season and it wasn't too bad hanging there. Just not nice to look at and a bit of a pain for cleaning. Good luck! I'll update you when I get plugs, new pump & proceed. I hope this thread will catch attention of others with similar questions. Since you're so nice. is this all I need for skimmer? Watched utubes of installing on intex pools. Looks very reasonable. At least with the skimmer, its already attached to wall, vs. the cutting of larger hole being "freehand". Had previously quick googled, yet found much higher price points, (didn't check specs). Just now saw this while already on Ebay. Yes, I paid twice that. Looks like it's all there.. The skimmer was the easy part.. Making it connect to the pump was harder. 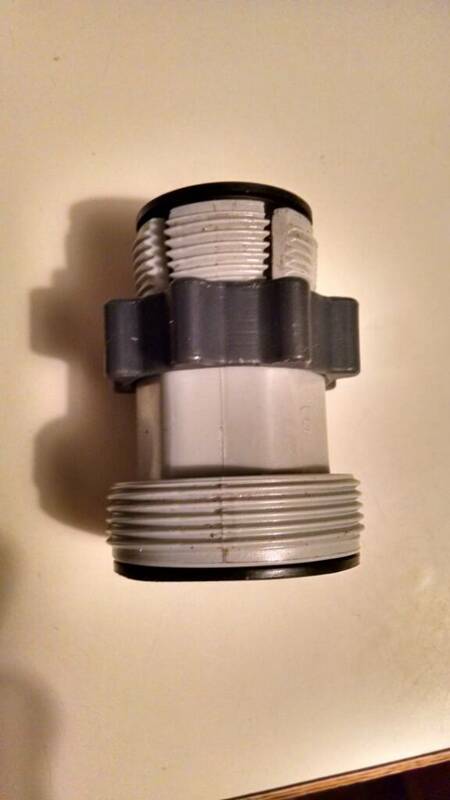 I used a1.25" to 1.5" rubber pipe connection to connect up to the PVC then put a valve in there to make it easier to winterize. 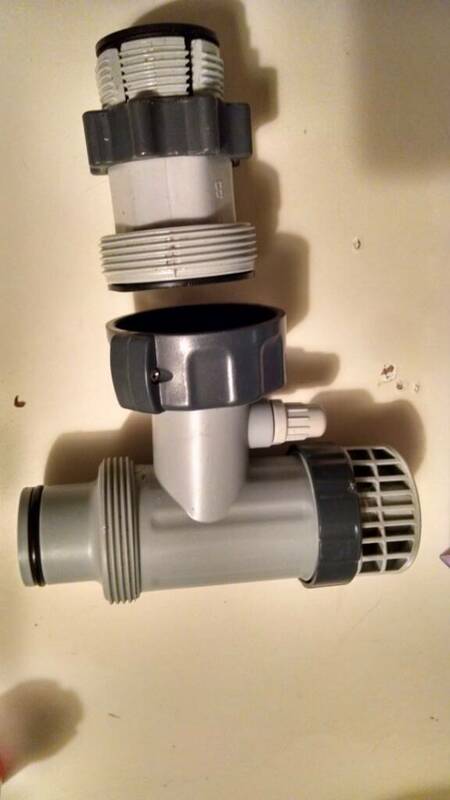 If you're going to do the 2 inlet (skimmer & regular inlet) I'll take individual pics for you. I had to cut and glue the PVC but they also make spa hose, it's just more expensive. Snagging the great price to have that Hayward skimmer on hand. Will see how my wall hanging intex does with a larger pump first. ??? Keeping fingers crossed until pool can fill.